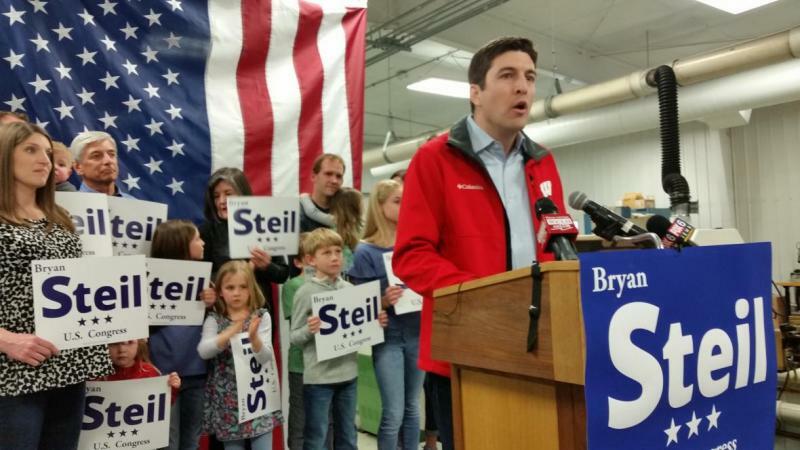 Wisconsin’s 1st Congressional District race has garnered national attention since its current occupant, House Speaker Paul Ryan, announced his retirement after nearly 20 years in the seat. Democrat Randy Bryce — an ironworker, former union organizer and veteran from Caledonia, Wisconsin — will face Republican Bryan Steil in the midterm election Tuesday, Nov. 6 for the southeastern Wisconsin district, which covers all of Kenosha and Racine counties, and parts of Milwaukee, Rock, Walworth and Waukesha counties. Bryce recently spoke with WPR’s "The Morning Show" host John Munson. The interview has been edited for brevity and clarity. John Munson: For better or worse a lot of people see this race as a referendum on House Speaker Paul Ryan. How do you convince those voters in this district that change is what's needed? Randy Bryce: Paul Ryan has talked about his plans for protecting Social Security as he calls it, but that was just merely privatizing it, turning it into a coupon care type of system. And we just saw recently after he gave away $1.5 trillion to the richest people in the country, I mean this is a tax plan that 83 percent of the wealthiest people in the country were going to benefit from … for working people it’s going to cost us more. But after seeing that tax scam one week later he came out and he admitted, well now we have to make cuts to Social Security, Medicare and Medicaid, he called them entitlements. But these are paid benefits that people have been contributing to their entire working life. JM: Senate Majority Leader Mitch McConnell recently said that the only way to lower that deficit would be to cut social safety net programs like Medicare, Medicaid and Social Security. That doesn't sound like something you'd be willing to accept. Why? RB: Absolutely not. These are things that help keep our elderly people out of poverty. A lot of people don't have pensions to rely on, 401(k)s. This is what a lot of people depend on, this is their lifeline to keeping a roof over their heads, to getting some kind of, you know, some amount of food on the table. It’s one of the most successful social programs in the history of the United States and nobody has done more to attack it than Paul Ryan and the Republicans. I want to stop rewarding the wealthiest people in the country who donate to campaigns ... this trickle down experiment that started under President (Ronald) Reagan has been shown to be a failure. It's just contributing to the income inequality, and especially right here in Wisconsin where the middle class is disappearing faster than any other state in the country. JM: In your view what needs to happen with the Affordable Care Act or just health care in general? RB: Right now we need to protect the things that are in place, especially pre-existing conditions. And unfortunately (Gov.) Scott Walker is directing Brad Schimel, the Wisconsin AG, to force ahead a lawsuit that's going to take that away from so many people. I've been in favor of Medicare for all. People deserve to have access to health care because right now even if they are insured, they can't afford to use it. People are stretching out their medications, I'm hearing about diabetics that are stretching out their insulin because they can't afford to go get it as frequently as it's prescribed ... that's not an adequate way of administering health care. And every other industrialized country around us has some kind of universal health care. JM: Besides the economy and health care, what do you think is one of the biggest issues affecting the 1st Congressional District? RB: A huge issue is our infrastructure ... one of the committees I’d love to serve on is transportation, with my background being a union ironworker, that’s something I’ve done for the last 21 years. Our roads and bridges are in horrible shape. It’s a great way to get people back to work and our infrastructure’s due. The life expectancy of the projects that were built was like 50, 75 years ago and that was done, that was one of the ways we got out of the Great Depression was by building it. And that turned us into a superpower. It's time to reinvest in the United States because it’s due to be reinvested in, to have our bridges upgraded, roads upgraded.